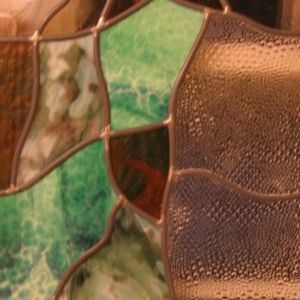 This stained glass bathroom half-window combines hand-poured opalescent glass, mouth-blown (antique) glass, and a droplet-textured manufactured glass. The combination satisfied the customer's desire for privacy while still admitting sunlight. The abstract design enabled us to feature glass color and texture, visible even at night due to the opalescent glass' properties that reflect interior light. The owners commissioned us to make this window and one for the master bathroom because of their pleasure with a pair of windows we created for their kitchen and dining room. 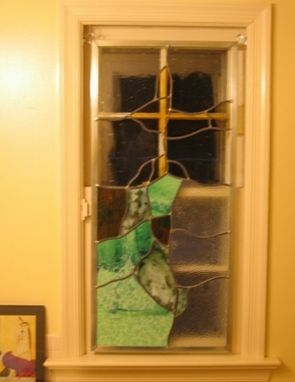 This stained glass panel is suspended in the window rather than permanently installed so that the owners would be able to take the window with them when they eventually moved.